Garages and garden sheds are a part of the home just as much as any other room is. It’s very possible to carry whatever design concepts you have utilised elsewhere through to these spaces, or to do something that creates a deliberate contrast with your main building. The key thing to remember is that these are semi-outdoor areas benefit from good design just as much as the living room, bedroom or kitchen. 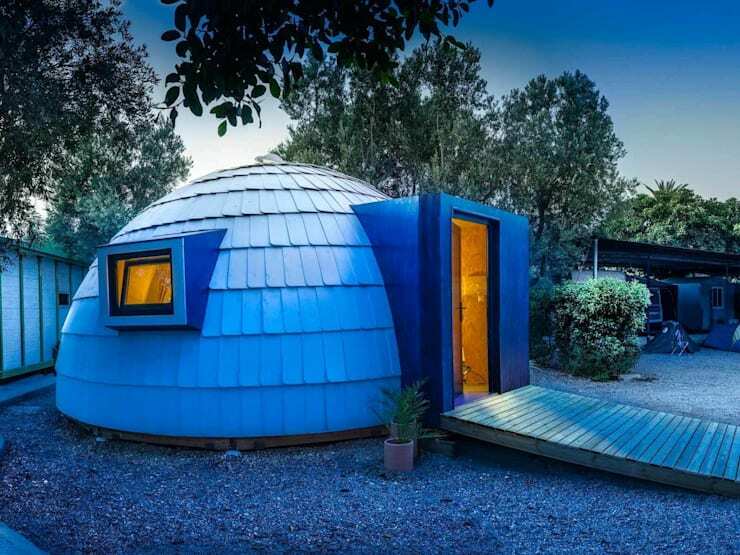 Stay cosy in the frozen wilderness of your back garden with this igloo-style shed. 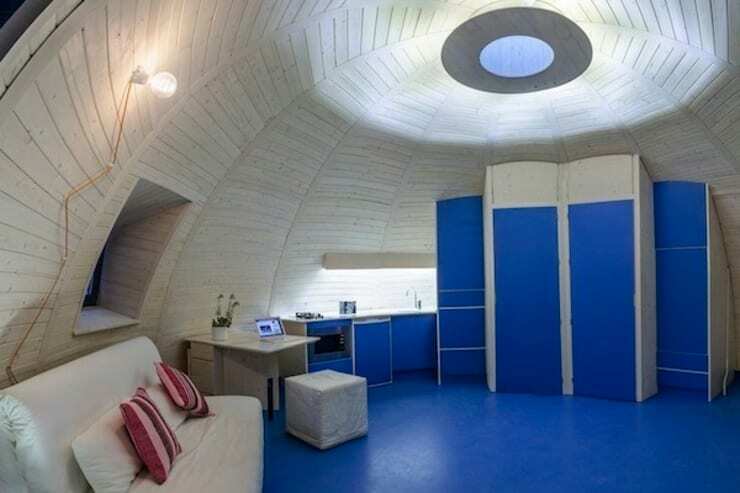 Instead of ice blocks there are roof tiles to keep the weather at bay, and unlike a real igloo you’ll have a window to look out at the world from. Inside the shed, the arctic theme continues with an wintry white and colour scheme. You could be forgiven, too, for mistaking that chair for a giant ice cube. A little den such as this one would be the perfect place to get away from it all and get lost in a book, or to do some serious work. If your office was an igloo, maybe you’d be more eager to get there each day. 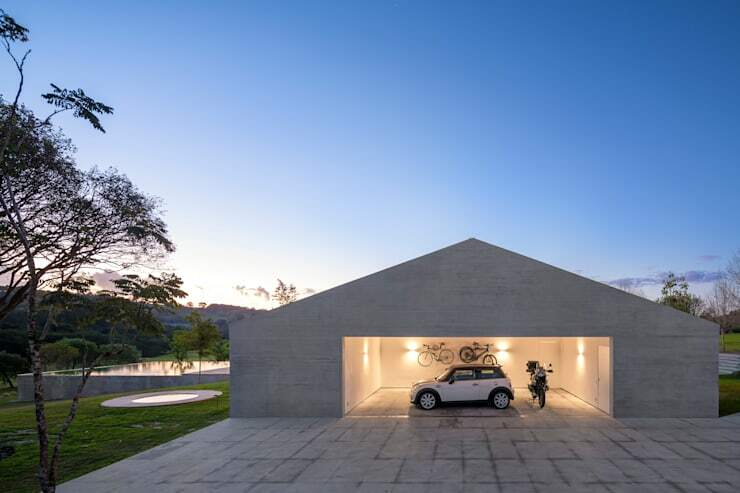 Uncomplicated but utterly striking, this cement garage makes a very solid statement. The silhouette is a very bold one due to the symmetrically slanted roof, not often found in garages. A garage like this would look at its most impressive in a rural setting, where the modern outline and blankly industrial cement surface would create a welcome and unexpected contrast with the natural surroundings. If your house has a strong look, it can be fun to try and recreate it in miniature for your shed or garage. This shed, for example, has been made out of the same narrow wood strips as the main house which can be seen in the background. 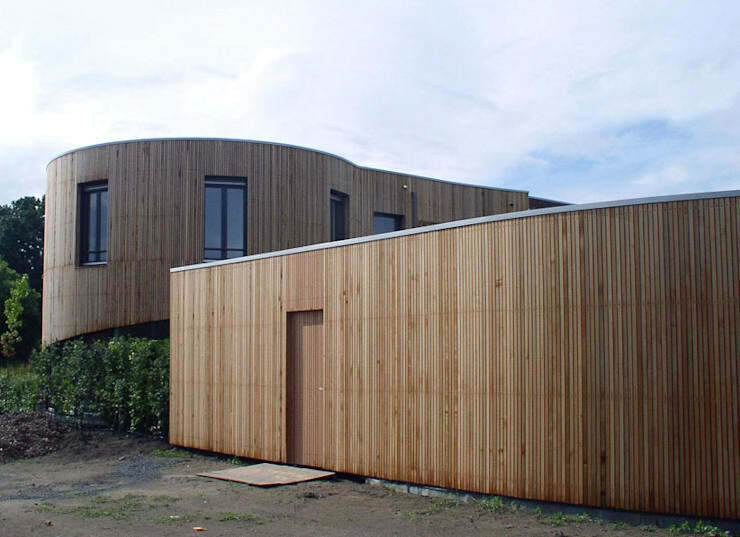 Using an identical material for the door and walls, and leaving windows out of the equation, makes the building appear strangely neutral and featureless. Because of the lack of natural light, this would probably be better as a storage space or as a comfy spot to enjoy evening drinks than as a home office. If you only need to store something little, then you only need a little space to store it in. This diminutive garage is just the right size for the motorbike it needs to house. Even though it’s technically just an afterthought to the main building, as much attention has been paid to its decoration as would be paid to an interior room. The lighting, wall and floor coverings and door design are all worthy of a much more traditionally important part of the home. 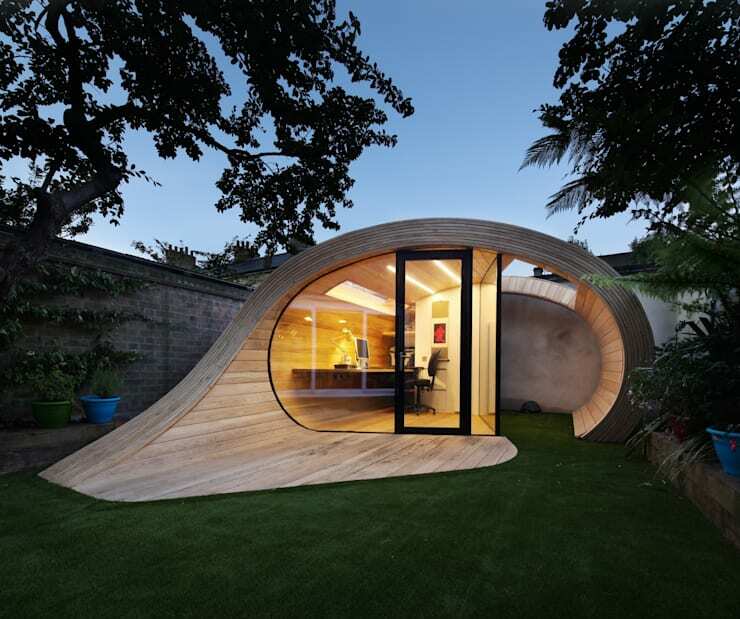 Using this gorgeously curvy shed to keep your old plant pots and garden tools would be absolutely unthinkable. With its compact, cosy interior and lots of glass to let the light in, it would be the best possible daytime working environment. 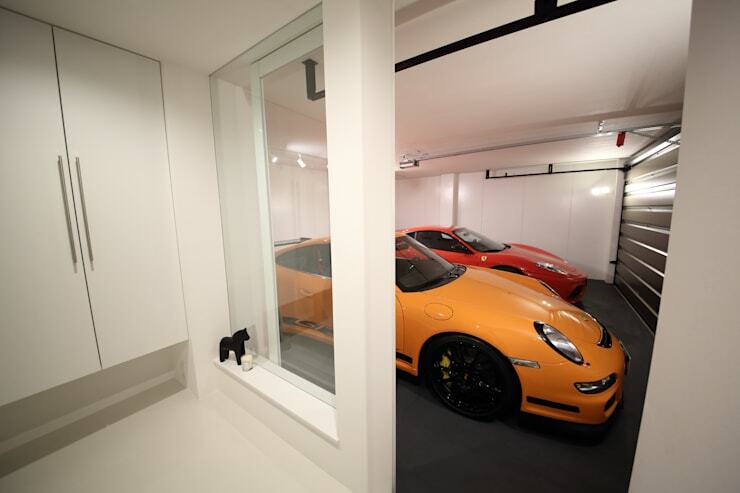 Garages which leave their contents visible from inside the house are becoming increasingly popular in modern homes. If you love whatever it is you drive, as the owner of this house clearly does, including an interior window or even a full glass wall that leads through to the garage is a good way of making sure your most prized possessions won’t escape the attention of any visitors to your house. A bit smug? Maybe. But then why splash out on a fancy vehicle if you don’t want it to be seen? Which of these is your favourite? Why? Are there any that don't grab you? Why not?